Carolina students check their bank account balances throughout the day, every day from their mobile phones. By urging students to be cautious about the sites they visit while using public Wi-Fi, classmates from the School of Media and Journalism have earned Information Technology Services’ top prize in a cyber security video PSA contest. The video shows a student checking her bank account balance while making purchases throughout the day. She’s logging onto her bank’s website via public Wi-Fi on her phone. We see her checking her finances while shopping at the Student Stores and again while buying coffee. When she tries to buy a beer at He’s Not Here, her bank card is declined for lack of funds. Some cyber thief has emptied her bank account. Sure, bank websites use SSL (Secure Sockets Layer) for establishing an encrypted link between a web server and a browser, making sites harder to break into than the video portrayed. 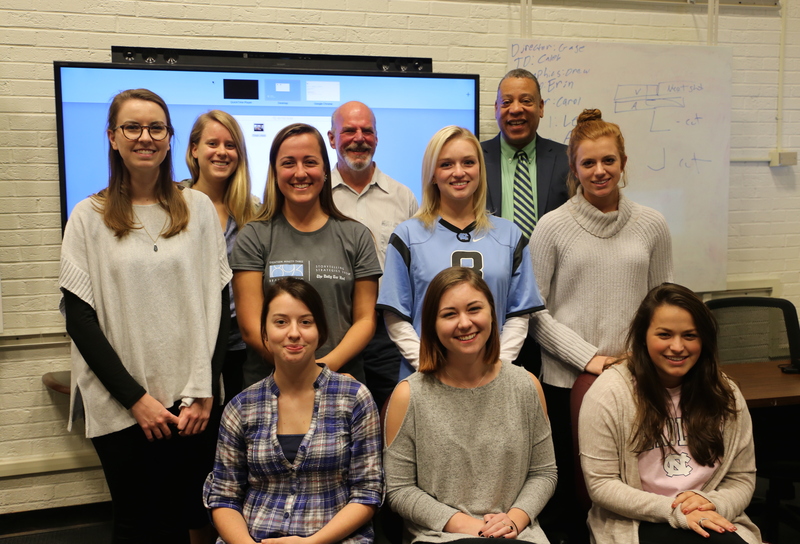 The winning team members from Professor Willis Smith’s Video Communication for Public Relations and Marketing class understand that after making the video about online security. The students’ message to be careful when using public Wi-Fi, nonetheless, is valid. The video was easy to follow, direct and well done, the contest judges decided. Tim Cline, ITS Information Security Specialist and the campus organizer of National Cyber Security Awareness Month, awarded the honors in November to the four-person team of Sarah Sturdivant, Michelle Brisson, Tess Allen and Marley Spence. Through the contest, the students expanded their knowledge and awareness of cyber security. “We learned that there are lots of different ways for you to fall prey to cyber security threats and that even the smallest mistake can kind of lead to big issues so you have to be really diligent in making sure that you’re taking every precaution necessary to protect your information,” said Sturdivant, a public relations and English double major from Lexington. She now waits until she gets home to a secure network to check her bank account and she makes sure she logs out of the website when she finishes, she said. This collaboration between ITS and the School of Media and Journalism is valuable, Smith said. “The ITS video PSA competition challenges students to conceptualize and organize a client-based public service announcement campaign from start to finish. Students get to perform ideation, scripting, story-boarding, production scheduling, video production and post-production,” he said. Click here to watch the video that took silver in the 2016 contest. ITS launched the contest in collaboration with Smith and the School of Media and Journalism a year ago for National Cyber Security Awareness Month, held each October. Click here to read about the 2015 contest and watch an interview with the winners from last year.